Two Storied (G + 1) new independent house available for rent at Posh residential aria, with Separate entrance to each floor. 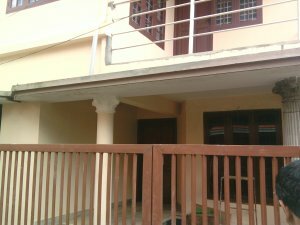 2BHK house semi furnished (Double bed, Cupboards, Fans, Kitchen cabinets etc...are available in both floor) ready to occupy at palakkaparambu Chalikkavattom only, suitable for 2 families or 2 executive bachelors. (In between EMC & Vytilla, 600Mtr from Vaishali bus stop NH bypass, 2/3km from Palarivattom Jn & Vytilla Jn. and 4/5 km to Kakkanad. &MG Road.) 2 bedroom with attached bathroom each floor, Kitchen with marble and Vitrified tile floorings, hall and sit out, Well and corporation water connection, Car porch, Balcony (First floor), compound wall etc.